If there’s one gift I always recommend for kids, it’s a Micro Kickboard scooter. I was thrilled to see the new Mini2Go Scooter because it’s geared towards18 mo+. There’s a seat for toddlers to sit on and then it daily converts to a stand up scooter. This is truly an awesome gift that will grow with a child. Winter months indoors can be really tough with a toddler. We had a trampoline for Maggie & Alex that was used non stop when they were 12M-3. Tommy is as active as can be these days and this trampoline will be under our tree for him to enjoy this winter! I like the one from Galt because it’s small enough to not take up much space, but is big enough for little ones to jump and play! Also, the handle and legs come off for really easy storage. Two other toys that we love from Galt are the Fill and Spill Barn and their puzzles. These are perfect for ages 12-24M and very well made. We love Green Toys in our house. My favorites are: the firetruck, tool set (comes in pink or blue), blocks and their dish set. 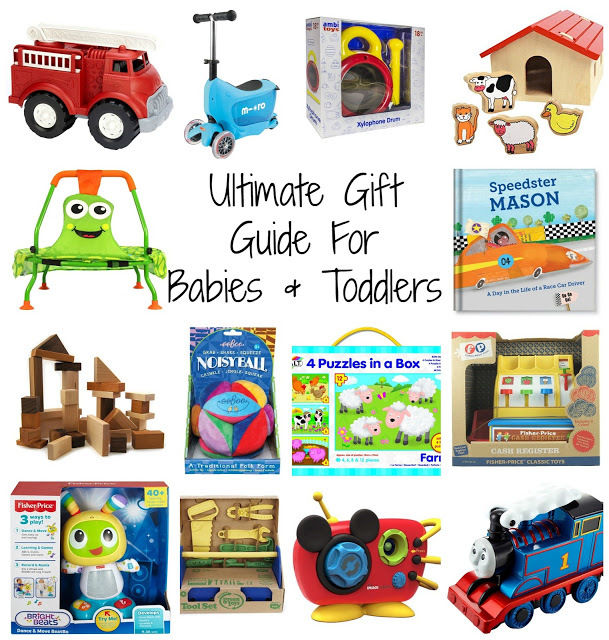 They have so many awesome toys for babies and toddlers. Plus all Green Toys are 100% recycled toys made safely in the USA. 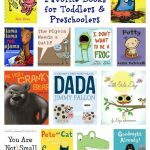 You really can’t go wrong with anything from this line for babies/toddlers. Blocks seem like the most basic gift ever, but there’s a reason they’ve been around forever – they’re fun! Blocks are also a great gift that will grow with the child. Right now, our favorite blocks are from Etsy shop Little Sapling Toys. They are handmade and high quality. Little Sapling has a lot of other really cute, unique gift options in addition to blocks. We love toy instruments and I wanted to find something different for this year. The Ambi Toys Xylophone drum is so neat and very inexpensive. It’s a musical toy that’s really 2 toys in one: a drum on one side and xylophone on the other. There’s an easy grip handle so little ones can take their band on the go! – Mode 1: Dance & Move mode is all about encouraging baby to wiggle & move. I added this to Tommy’s Christmas list after he looked at it for an entire trip to Target. Usually I spend the whole shopping trip trying to keep him from jumping out of the cart or holding him, but the Shape Blaster totally had him glued. The toy helps to teach shapes through music and song. The songs are upbeat and fun and my girls were singing along with it too. This toy is sure to bring back memories. I can remember this cash register being a toy in my Kindergarten classroom. Cash registers are always a fun gift for toddlers and this classic is my top pick this season. It’s interactive, colorful and fun. This new Thomas & Friends toy makes fun sounds and says cute phrases. It also does some crazy cool tricks! You use the included remote to make Thomas spin in reverse, pop a wheelie and even do back flips! These books are my favorite personalized gift. They are fun to create and are beautiful books. My girls love every I See Me book they’ve ever received because the book is “all about them”. This Christmas I made Tommy the race car book from I See Me called “Speedster Tommy”. It is absolutely adorable and I can’t wait to read it to him when he opens it! The Noisy Ball is bright, soft and fun for ages 0 & up. It’s fun to grab, throw and crinkles, jingles, and squeaks! You can also find it on Amazon. Ambi Toys Pocket Cars, Focus Pocus and Trumpet: All are bright, safe and fun for little ones! I like giving little ones clothes and shoes for the holidays because it’s useful and practical and they are too little to be disappointed that they can’t play with their gift! 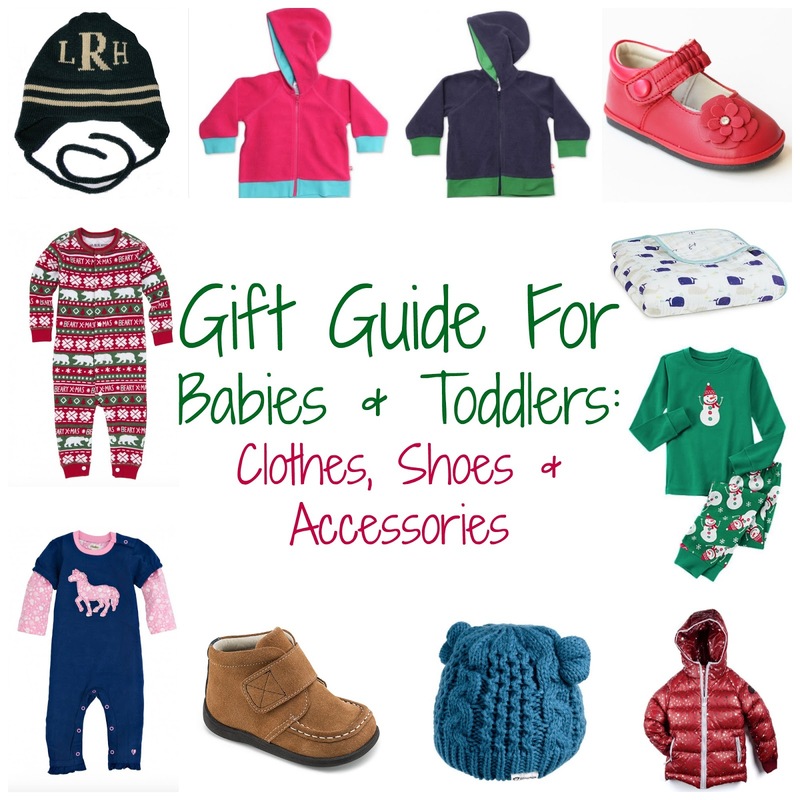 In addition to giving clothes and shoes as gifts, this list is great for picking out holiday wear for your own little one to sport this season – especially the holiday pajamas! Sleepy Rompers. For daytime, Hatley has great Rompers and Play Sets. We have both styles and they hold up really well for lots of play! 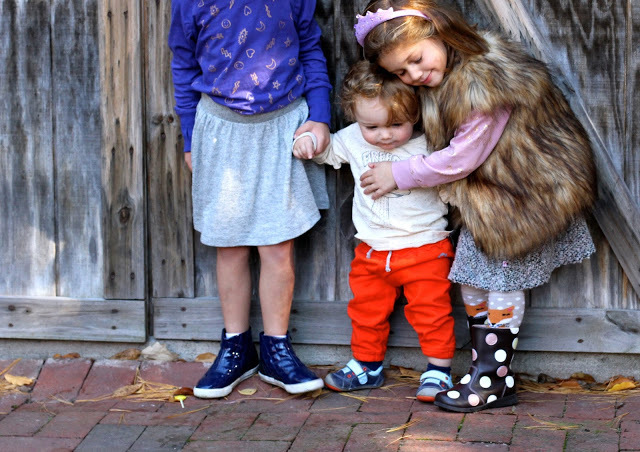 I like the bold prints and soft material of Hatley clothes for babies and toddlers. 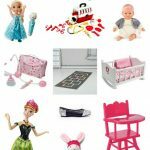 Their whole line for little ones will make great gifts! It’s not clothes, not a toy, but still a perfect gift! The Aden + Anais Dream Blanket is a favorite for all of my kids. From rolling around on it as babies to sleeping with it well past the toddler years, this blanket is soft and super snuggly for winter time. Aden + Anais has so many cute new patterns in the Dream Blanket right now. I love the “High Seas” whale blanket. If you want to give a gift that will keep a baby or toddler very warm this winter, head to 7 A.M. Enfant. Their whole line is designed to keep little ones very warm. While staying warm with 7 A.M. Enfant, they’ll also be stylish in the bright colors and cool styles. We have the Infant Hat and Mittens set and really like it. The under the chin strap is key for keeping a hat on a baby/toddler. Tommy needed some dress shoes for the holidays and I found the cutest traditional holiday selection for babies at Babychelle. They had your traditional saddle shoes for boys, red Mary Janes for girls and so many other adorable options. 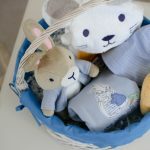 Zutano is always a go to brand for me when buying baby gifts. I’ve never been disappointed with anything I’ve gotten from this brand, for my own children, so I am confident buying Zutano for gifts. They also have adorable accessories to use for stocking stuffers or to match the clothing gift you buy. Their hats, gloves and booties and a super cozy option! For a snuggly pair of holiday pajamas, we love the Gymboree Gymmies. They have so many styles for babies and toddlers. There are both 1 and 2 piece options. They also make it easy to get matching Gymmies for siblings – most styles come in options for boys and girls from baby up to size 12. Tommy is getting some cute Gnome One-Pience Gymmies to match his big sisters two-piece gnome Gymmies. We love See Kai Run shoes. They have great shoes for little ones to wear at the holidays. They look nice and keep those tiny feet well supported and comfortable. See Kai Run also has awesome boot options for winter gift giving. 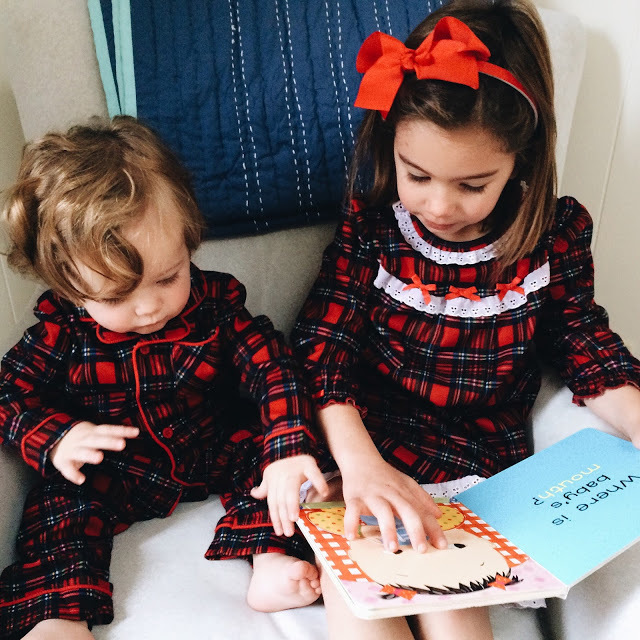 Little Me has my favorite, classic plaid flannel holiday pajamas for boys and girls. They are adorable and make really cute holiday photos too. Little Me also has a whole line of festive clothes for babies and toddlers. There are also really cute Little Me sets that make great gifts. I think personalized winter hats are the perfect gift for a baby or toddler. They are cute, personal and will keep the little one’s head warm all winter. I can’t wait to give Tommy his new hat with his name on it! Our favorite personalized hats are from Sila Boutique. Appaman has every type of clothes you could need for the baby/toddler you are shopping for: outerwear, play clothes, formal holiday clothes and awesome accessories. 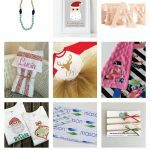 Their styles are hip and fun for gift giving. They are also really comfortable and well made. My girls love Appaman and think it’s cool that baby brother can wear it too now.